It’s hard to find any bright spots after being swept in a playoff series. 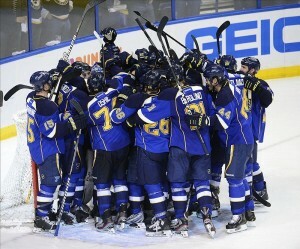 If one team can, it is the St. Louis Blues. The Blues had their season end Sunday afternoon, as the eighth-seeded Los Angeles Kings took the Semifinal Series, 4-0. The Kings out-scored the Blues 15-6 in the series and the Blues were scoreless with the extra man after receiving 17 power-play opportunities. Those are not the bright spots. While the Blues may not have ended the 2011-12 season on a high note, they battled through a tough season that earned them 109 points in the regular season and a first-round playoff victory. These were not the expectations heading into this campaign. After missing the playoffs in 2010-11 by ten points, the Blues made some shake-ups over the summer. GM Doug Armstrong brought in many new faces, all of whom were proven NHL veterans. Forwards Jamie Langenbrunner, Jason Arnott and Scott Nichol, along with defenseman Kent Huskins and goaltender Brian Elliott, were all fresh faces arriving in training camp in September. The Blues upped the average age of the roster while also bringing in a quality backup for starter Jaroslav Halak. Blues media and personnel expected a good fight for the playoffs. They were given much more than that. Blues President John Davidson made the call in early November to make a coaching change, after the team started off the season 6-7-0. Davis Payne was replaced by veteran Ken Hitchcock and the team responded almost instantly. They became one of the most dominant teams on home ice (30-6-5) and really established an identity as a blue-collar, hard-working team that will make the opposing team battle for every inch of the ice. Between the pipes, Halak stumbled out of the gate. Elliott stepped in and showed that with a strong defense in front of him, he can be a force to be reckoned with. Elliott not only backed up Halak when it was needed, but took the starting job many times throughout the season. He posted a 1.56 GAA and a .940 save percentage, both tops in the NHL. He also posted 9 shutouts, including a 241:33 continuous shutout streak (spanning over 5 games) late in the season. 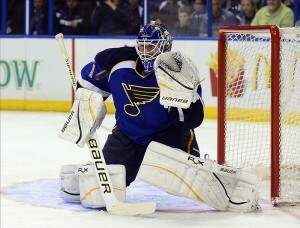 By far, Elliott was one of the league’s biggest surprises, and best overall goaltenders, in 2011-12. Elliott’s strong play early forced Halak to pick his game up from the dumps. After starting the season 1-6-0, Halak turned his game around right at the time of the coaching change. Hitchcock made the decision to start Halak in his first game behind the bench. Halak earned a 3-0 shutout victory over the Chicago Blackhawks on November 8 and never looked back. Halak improved his game so much that he ended the season with a 1.97 GAA (tied for 4th in the league), .926 GAA (6th in the league), and 6 shutouts (tied for 5th in the league). No performance was more magical than his 22-save shutout victory over the Kings on February 3. The team defense was just as impressive as the goaltending, as the Blues allowed just 26.7 shots-against-per-game in the regular season, which was best in the NHL. Only 2 players who played in over 40 games had a minus-rating. Defenseman Alex Pietrangelo, only in his second full NHL season, stood as the hands-down best defenseman on the Blues’ roster. Constantly facing the top lines of the opponent, Pietrangelo ranked 3rd on the team in points (12G-39A—51P), while also posting a plus-16 rating and averaging 24:43 time-played-per-game. He received a lot of James Norris Trophy buzz, but was ultimately left out of the nominations. Forward and Team Captain David Backes also helped the Blues maintain a strong defense throughout the lineup. While he did take a dip in numbers from the season prior (31 goals on 2010-11; 24 goals in 2011-12), he was used against top lines every game and still posted a plus-15 on the season. He was announced as a finalist for the Frank J. Selke Trophy as the top defensive forward on April 23. Though the second round loss was disappointing, the Blues still had a hard-fought battle for the President’s Trophy, their first Central Division Title in over ten years and even defeated a powerful first round opponent in the San Jose Sharks. This will add experience throughout the core of the lineup; the one thing that was lacking from the play of the young Blues players. The team may not have scored many goals, but they were better known for their ability to keep their opponent in their defensive zone. Strong forecheck and pressure on the defensemen were truly the keys to victory for the Blues all season long. Hitchcock imposed a system that calls for a steady lineup top-to-bottom and that is exactly what Armstrong has built. Let’s not forget, Blues fans, that feeling that you felt when Jamie Langenbrunner scored the game-tying goal in Game 5 of the Blues’ 4-1 series victory of the first round. Stay tuned to TheHockeyWriters throughout the Blues’ off-season for player grades, draft coverage and free-agency news.